We offer Free-Standing and Portable Telescopes. Find the Telescope that's right for you and have a better look at the world around you. 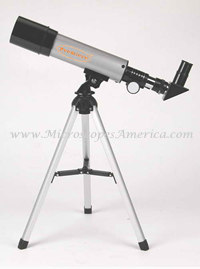 The Early Astronomer Stargazer telescope is perfect for anyone interested in exploring the skies. The portable design makes stargazing easy. Easy to use 3 in 1 Microscope. Spy Scope 3-in-1 Telescope/Microscope/Magnifier.